I love sheer lip colors, but I have unevenly pigmented lips and most tinted lip balms don't show up too well on my lips. Bare Minerals Pop of Passion Lip Oil-Balms definitely seem to pack a bit more on pigment, and some of the swatches actually left behind a stain on my skin. I haven't tried these lip balms on myself, so I cannot comment on how they would fare with actual use, but there are some fun colors in there, and the formula feels quite light. 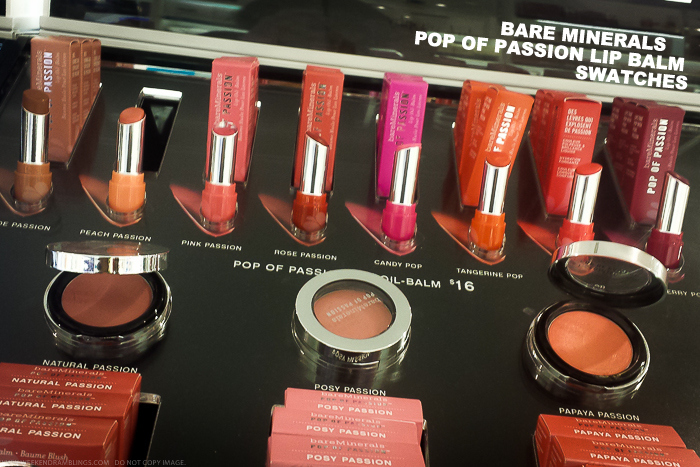 Give these a try at the counter if you are on the lookout for some fresh spring/summer lip color.